It's Muffin Tin Monday again, this time with a circus theme. Despite having this theme posted for ages, I had no clue what I wanted to do for it. Finally, while looking for something completely different, I came across two large popcorn buckets from the Dollar Tree. I figured, they could be the container and some of my million silicone muffin cups could serve as the tin! The picture didn't turn out quite as well as I hoped, this is actually the inside of one of those big square red/white striped popcorn buckets. 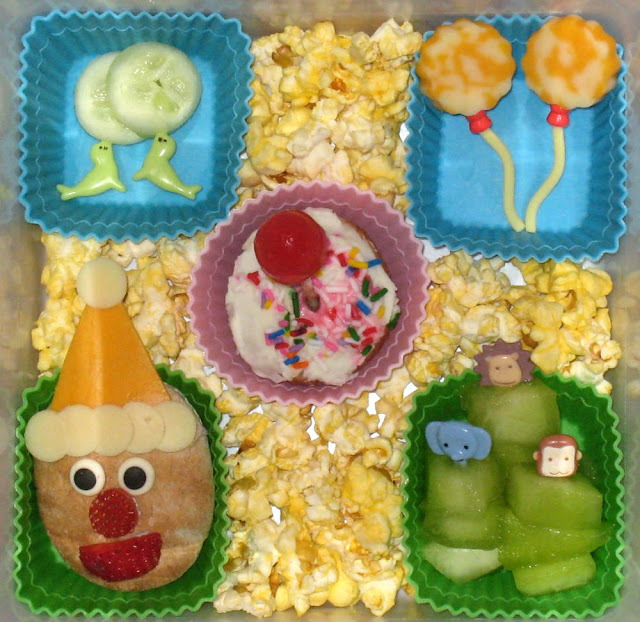 We have two seals balancing cucumber balls on their noses, two flowery cheese balloons, a mini pita pocket clown sandwich with strawberry mouth and nose, sugar eyes and a cheese hat, circus animal kebab sticks with honeydew, a really festive cupcake thingie (leftover from Faith's birthday at church), and a layer of popcorn. It did look really cool in the bucket! I knew you'd do something awesome, love it! The clown is adorable. Those seals and cucumber balls are too cute. The clown is so cute. I love your wonderful seals and animal picks. I love the picks! Where did you find them? I have seen those buckets at the dollar store too - what a great idea to make a "bed" of popcorn for your liners! Very cute. Cute meal!! This one was a hard one for me. I am enjoying seeing all the ideas everyone has come up with. ADORABLE! This theme was hard for me too -- I took pics but haven't uploaded them yet. . . . and, I second the previous comment -- love the picks! Love the seals with the cucumber balls! So cute! So cute! I love the popcorn! That's probably the most inventive MTM presentation I've ever seen! How fun! Also, I have to know: where on earth did those animal picks come from?! I *must* have some monkey picks for my collection!